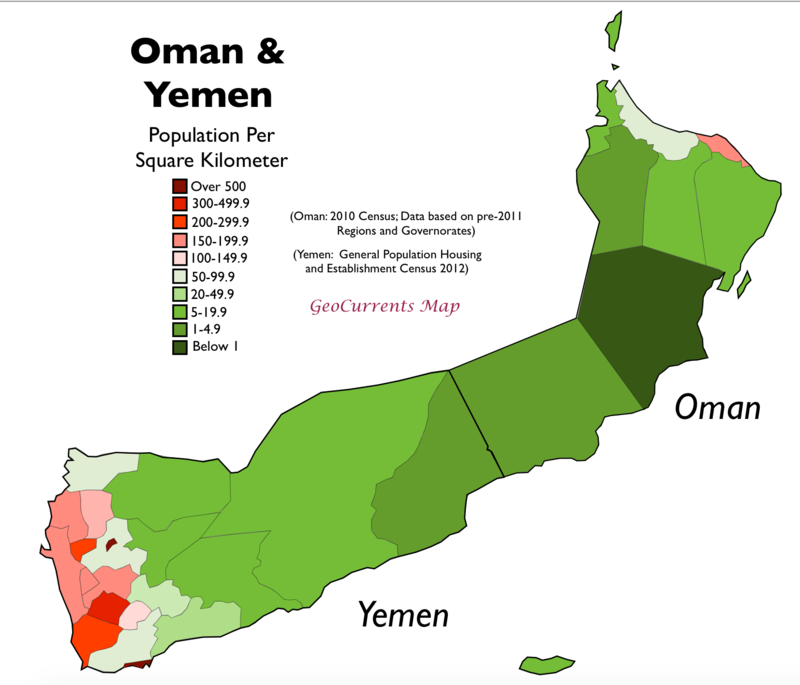 At first glance, Oman and Yemen almost appear to be sibling states. They fairly evenly divide the southeastern slice of the Arabian Peninsula. Both countries have extensive highlands on their opposing extremities, which receive much more rainfall than the rest of region and thus allow intensive agriculture both within the uplands themselves and in the adjacent lowlands. They share the seasonally wet central coastal area of Dhofar/Al Mahrah. Both countries sit at the entrance of a vitally important strait that leads to a major sea (the Strait of Hormuz leading to the Persian [Arabian] Gulf in the case of Oman; the Bab-el-Mandeb leading to the Red Sea in the case of Yemen). 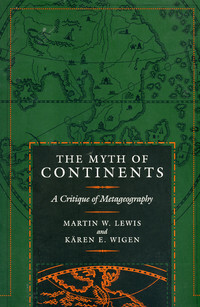 The histories of the two countries are also closely linked. Some sources date the formation of Oman to the migration of a large portion of the Azd tribe from Yemen in the first century CE, following the collapse of the Great Dam of Ma’rib, one of the engineering wonders of the ancient world. 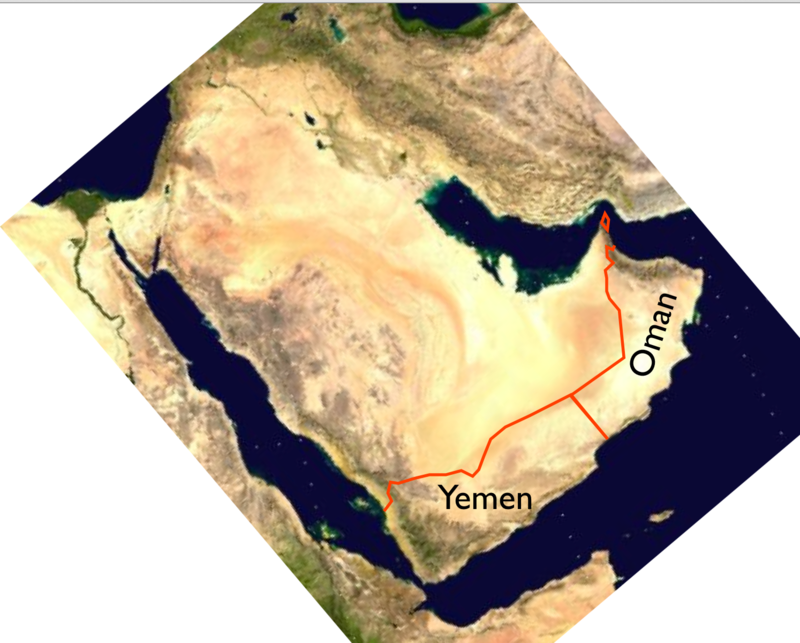 As noted in the Wikipedia article on Oman, “The present-day name of the country, Oman, is believed to originate from the Arab tribes who migrated to its territory from the Uman region of Yemen; many such tribes settled in Oman, making a living by fishing, herding or stock breeding…” Both countries also share a similar historical dynamic in the tension between theocratically oriented, inward-looking inland areas and more secular, cosmopolitan coastal regions. 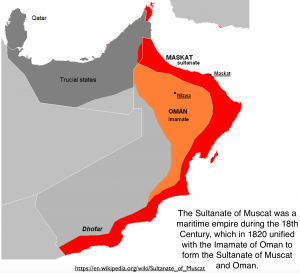 Key to understanding Omani history was the periodic tension between Oman Proper, generally ruled by the elected Ibadi Imams, and the coastal Sultanate of Muscat (before 1970, the official name of the country was “Muscat and Oman”). 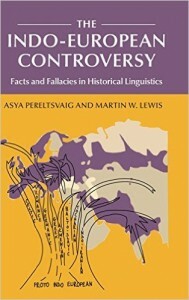 Similarly, the history of Yemen must be understood in the context of the long-lasting rivalry between the Zaidi Imamate of the northwestern highlands and the more secular rulers of the coastal and southern highland regions. 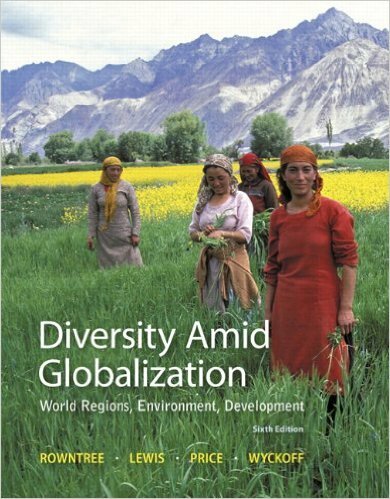 Equally significant is the fact that Oman and Yemen were two of the world’s least internationally oriented and socio-economically developed countries in the mid-20th century. 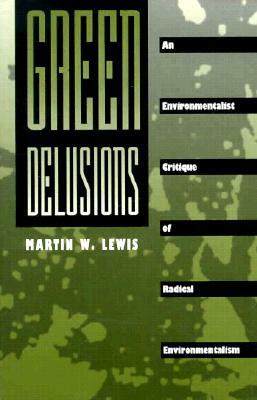 Such similarities should not be exaggerated, however. 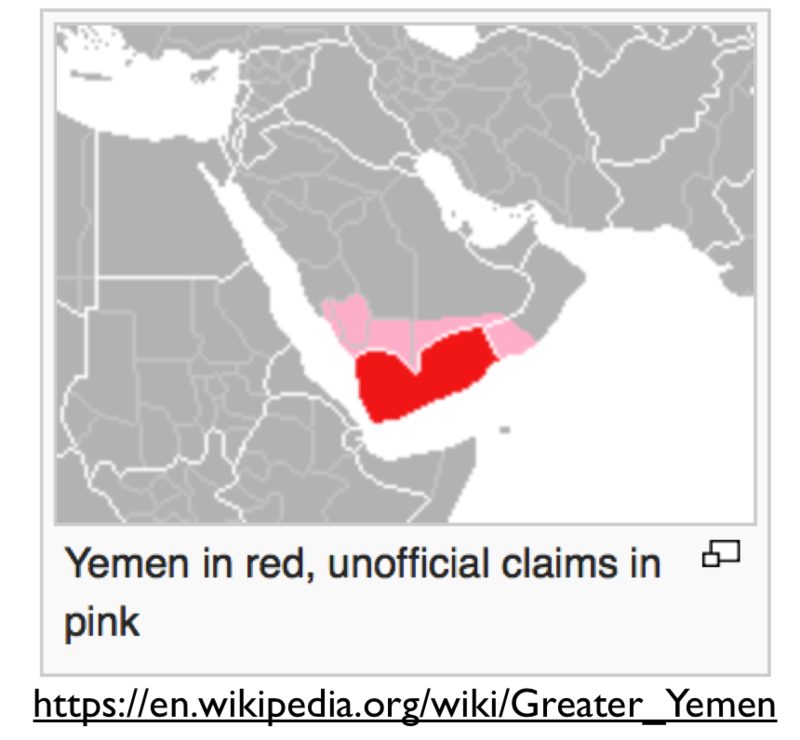 Yemen’s highlands are much more extensive than those of Oman, and they receive significantly more rainfall. 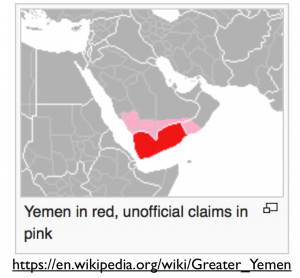 As a result, the population of Yemen is, and has long been, much larger than that of Oman. Oman, moreover, has nothing like Yemen’s Hadhramaut, a sizable desert area with abundant water in its deeply incised wadis (seasonal waterways), which allow intensive cultivation and settlement. But despite Yemen’s much larger population, Oman played a much more important world historical role in the early modern period, when its Muscat-based empire controlled large parts of the western Indian Ocean basin. “Yemen proper” (the more densely populated western third of the country), on the other hand, was never much of a power center in this period. The Hadhramis of the Hadhramaut, on the other hand, did play a major economic and cultural role across most of the Indian Ocean realm, with their diaspora taking them all the way to Indonesia. Despite their similarities, Yemen and Oman are today remarkably different places. Yemen is war-torn country at the edge of being a completely failed state. Even before its recent descent into chaos, it was noted for its poverty and general lack of development. 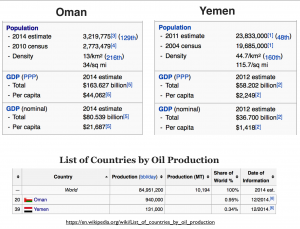 Oman, on the other hand, is a stable and prosperous state, with a per capita GDP almost 20 times that of Yemen. It is tempting to attribute Oman’s better fortunes solely to oil, as oil wealth has allowed its extraordinarily rapid progress in the late 20th and early 21st centuries. 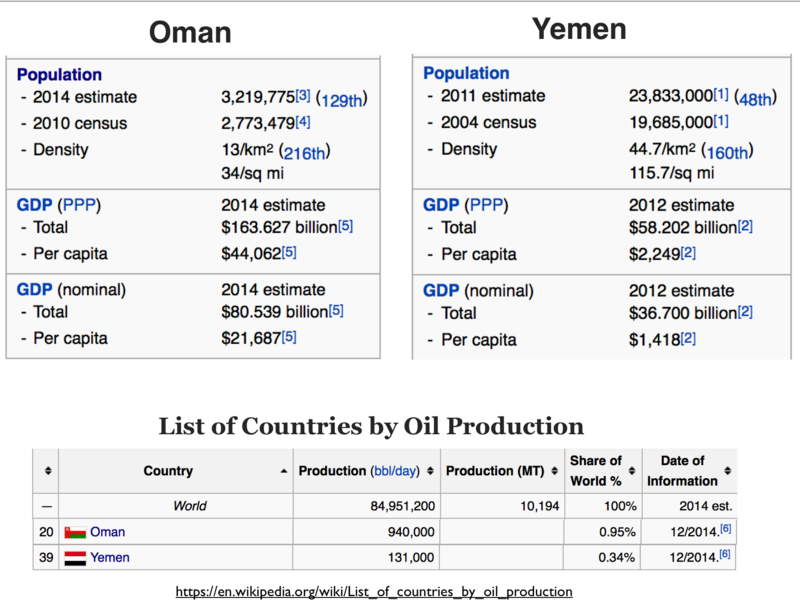 As the table posted here shows, Oman’s oil production is much higher than that of Yemen. 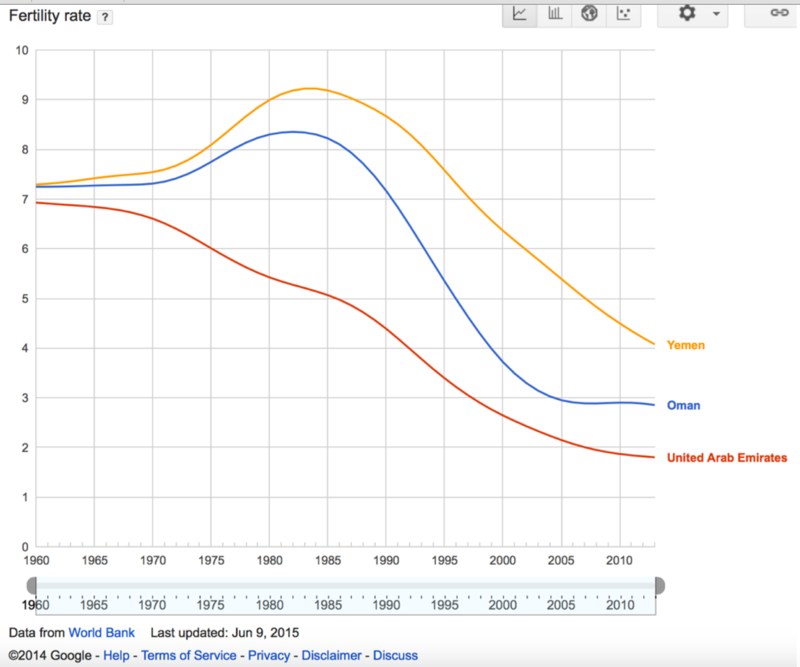 The fact that Oman’s population is much lower, moreover, means that its oil revenues go much further. 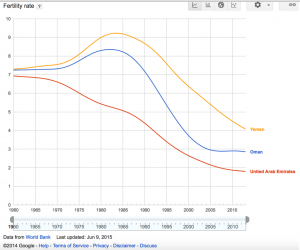 Here the discrepancy between the two countries will only grow more pronounced, as Yemen’s birthrate in much higher than Oman’s, although it is dropping rapidly. Due to a combination of Yemen fast-growing population, chaotic politics, rampant insecurity, poverty, and general aridity, the country is experiencing a water crisis that could prove devastating within the next few decades. Oman faces problems of its own, most notably an impending oil production decline, but it will probably be able to adjust, given its more general developmental success and its small population. Much depends, however, on the sultanate’s uncertain political succession, as mentioned in a previous post. The president, Ali Abdallah Saleh, rules by maintaining a precarious balance among a variety of competing forces, including the military and the security apparatus, the main tribes, political parties and factions, and key clerics. By buying loyalty through patronage and ruling through a combination of cooptation, inclusion and coercion, Saleh has painstakingly built an “administrative feudal system”2 that has evolved into a mix of “kleptocracy and plutocracy. On January 12 [2-12], through social media, Yemenis are organizing an event called “I want Yemen to change – I will not store qat”. This event, organized by Hind Aleryani, a Yemeni activist based in Beirut and who made headlines with the “Shame Reuters” campaign, is a call for all Yemenis, wherever they are, to say no to qat, to not store any qat and to protest the cultivation and consumption of qat. International organizations should watch for this event and support the people of Yemen in making a transition that is much more difficult than any political process: That of building a new country in which the widespread cultivation and consumption of qat can be eventually replaced. Despite Yemen’s myriad problems, a “Greater Yemen” movement evidently still seeks the enlargement of the country, hoping to acquire the southwestern corner of Saudi Arabia as well as Oman’s Dhofar Governorate. Right now, there seems to be a larger chance that a “Lesser Yemen” will emerge from the wreckage of the shattered state.